Capital of the department of Meuse, France. Jews resided there from the twelfth century; and among the scholars of the city may be mentioned the tosafist Samuel b. Ḥayyim (Tosef., Yeb. 65a, 66b; Tosef., M. Ḳ. 23a; Tosef., B. Ḳ. 77a, 89a), Samuel b. Joseph the Younger (Tosef., Niddah, 28a), and Jacob b. Joseph, brother of Samuel. In 1433 Canon Guillaume Chaney made, on behalf of the chapter and the city, a fruitless request to the Council of Basel to relieve the strained financial situation by authorizing expelled Jews to return to Verdun; but until the annexation to France in 1559 of the three bishoprics of Toul, Metz, and Verdun, all rights of residence in the town and even of transit through it were forbidden to the Jews. 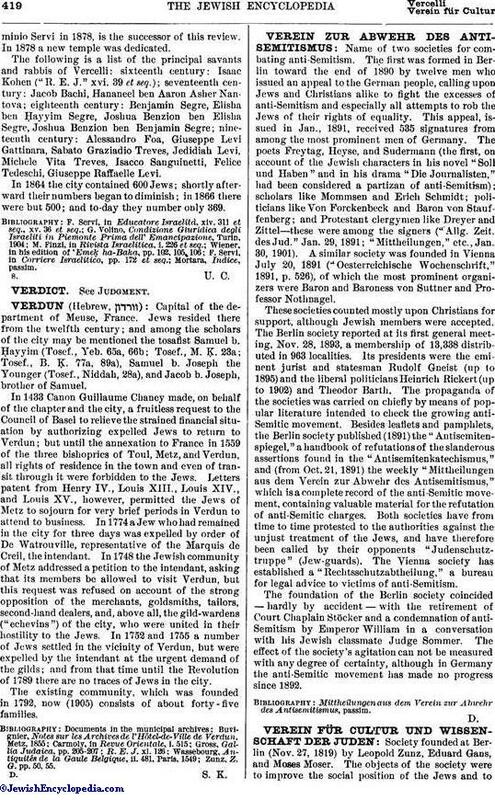 Letters patent from Henry IV., Louis XIII., Louis XIV., and Louis XV., however, permitted the Jews of Metz to sojourn for very brief periods in Verdun to attend to business. In 1774 a Jew who had remained in the city for three days was expelled by order of De Watrouville, representative of the Marquis de Creil, the intendant. In 1748 the Jewish community of Metz addressed a petition to the intendant, asking that its members be allowed to visit Verdun, but this request was refused on account of the strong opposition of the merchants, goldsmiths, tailors, second-hand dealers, and, above all, the gild-wardens ("echevins") of the city, who were united in their hostility to the Jews. In 1752 and 1755 a number of Jews settled in the vicinity of Verdun, but were expelled by the intendant at the urgent demand of the gilds; and from that time until the Revolution of 1789 there are no traces of Jews in the city. The existing community, which was founded in 1792, now (1905) consists of about forty-five families. Zunz, Z. G. pp. 50, 55.